Our first estuary experience in South Carolina last December whetted our appetite for more of the same and we wanted to experience the Pacific version of this delightful way to be on the water. What I didn't know before visiting is that the agency I work for, USDA-NRCS, has been working the Slough for several years, contributing the the restoration in many ways. Choosing to travel the weekend after Memorial Day, we hoped that some of the crowds may have thinned a bit. What we didn't plan for was cold winds and highs in the 50's! Of course, Mo used to live near the coast, so she was more accepting of the cold weather than I was. Finding a place to camp near the beach is hard, and finding anyplace to camp actually ON the beach with a view of the water is even harder. We settled on Sunset Beach State Park, just west of Watsonville. It was about 10 miles north on HWY 1 from where we planned to do our boating beginning at Moss Landing. We left Jamestown by 10 or so, and got to the beach by 3 in the afternoon. The drive to the coast is becoming familiar, but we do like to skip around some of the major roads and check out the side roads. This time we traveled down 101 from Gilroy, which smelled fabulously like it's famous garlic, and crossed the coast range via historic HWY 129. I didn't find any historic sites to speak of, so will have to ferret out the history at another time. What did become apparent as we got closer to Watsonville, however, was the incredible bounty of fruit that dominates this area in the spring. Cherries everywhere, and as we got closer to the coast, the cherry orchards gave way to vast fields of strawberries, brilliant red in their ripeness against the green leaves. They are grown on raised beds covered with plastic, and in some cases those beds look more than 2 feet high above the center rows. Farm workers were everywhere, harvesting, bent over picking, and the surprising thing was that there were so many cars all lined up near the fields, fairly nice cars actually. We only saw a couple of places that had the white farm labor buses for the workers transport. As we crawled though Watsonville, the traffic was slowed by long lines of semi's waiting to be loaded, and small farm trucks piled high with empty strawberry crates heading back to the fields. I bought a flat of berries for making jam that were the size of small apples, and soft, ripe, and sweet as anything I have grown in my own garden. 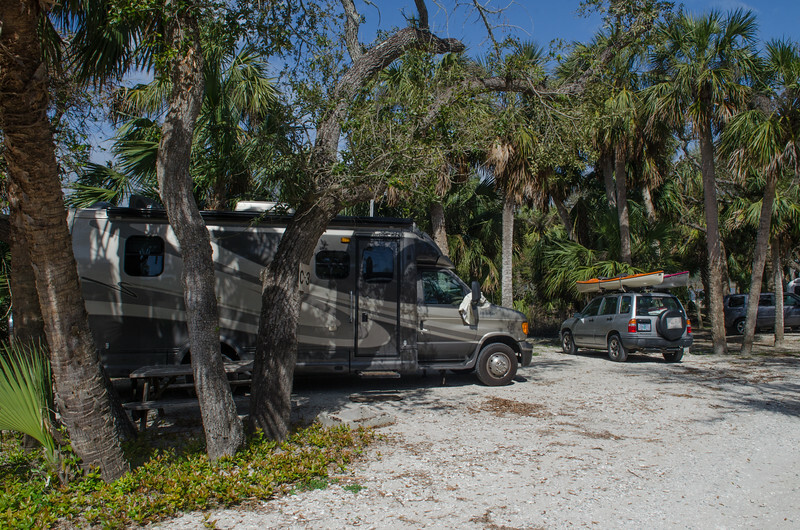 The web site for the park discusses the fact that it is surrounded by agricultural land, and that our campground was in the dunes. I think somewhere in the fine print, it actually said there was n o view of the ocean. Not only could you not see the ocean, you couldn't hear it either, and when we were relaxing by the fire, there was nothing to remind us we were at the ocean except the sand. The campground itself was nice, except I neglected to remember that there were no hookups. I am sure I must have known this when I made the reservation, but somehow I forgot, and as we looked around our space and realized we were drycamping, it was a silly moment. We had enough propane but our water tank was only 1/3 full, so Mo patiently carried gallon jugs of water and filled the tank with a funnel, while I put put away the DVD's we brought for some light evening entertainment. No generator after 10 pm was the rule, and neither one of us is up to that kind of late hour for a movie! The other thing I hadn't remembered is that Sunset Beach isn't a dog friendly beach. We did read about the other state park just north allowin g dogs and stopped to verify that with the park ranger when we decided to go for an early evening beach walk with Abby. He was great, and told us that we could take her down the stairs to the beach that say "no dogs" if when we got to the actual beach we only walked north and not south where the snowy plover is nesting. That made our beach time a little bit easier, we only had to drive a 1/4 mile or so to get to the stairs. There was another set of stairs near our campsite, but they were high and steep, and the distance down to the beach on the ocean side was a bit daunting. Ever climb sand dunes?? Whew! Another trail to an observation platform overlooking the ocean was closed for restoration of the fragile dune vegetation. We were grateful for the one beach where Abby could go, however, and managed long beach walks every day at one time or another. The other surprise was the number of people in the campground, especially the number of children. I have never seen so many tents in my life in one place, and only after the weekend drew to a close did we discover that there was some kind of gathering going on, and when Sunday night rolled around everything got quiet and peaceful again, actually what we had originally expected. I still don't know if that campground is always that full, but it was definitely full to bursting on Friday and Saturday. I was glad we had planned to be away during the day! We cooked steaks on the bbq for our first evening supper and it was great. Mo brought plenty of wood from Klamath so we had great fires morning and evening every day. The campfire pit was a big metal barrel, and at first we thought it wouldn't be as good because we couldn't see the fire, but later discovered how much heat that barrel puts out. With the previously mentioned cold and wind, that heat was very welcome! After walking around when the campground thinned out, we discovered a perfect campsite in the southernmost section, site number 25, on a hill with a view of the ocean. I would imagine that site would have to be reserved far in advance, because I think it is the only one with that view. Reading the tide tables indicated that high tide would peak at 8:30 am. This meant that for our trip up the slough, we would have to be on the water 2 hours prior to that, and then we could come down with the outgoing tide. Of course, on the coast, at the 530am wake up time, it is cold and damp and foggy. Not exactly the best weather to get out in a boat, but of course fishermen do it all the time. We drank warmed up coffee and headed for our put in site at the wharf in Moss Landing. It was really quiet there, with just a couple other people around, and no kayaks on the water at all. The put-in there was easy, though, with smooth level sand just a few feet from the road where we unloaded the kayaks. Into the water, and around past the dock and under the bridge and the adventure began. The animals were amazing. The dock was covered with sea lions, the harbor was filled with harbor seals, swimming all around us, and sea otters were everywhere, watching us with curiosity before they would roll over in the water and continue their feasting on whatever they were eating. I took this all for granted on this first trip out. I had read about Elkhorn Slough and the animals there, and expected to see otters and seals and lots of birdlife, so didn't think this was at all unusual. All the way up the slough the otters were surrounding us, and there were water birds of all kinds. The brown pelicans we expected, but were especially delighted to see three of our old white pelican friends coming down the water. There were snowy egrets and great egrets, white herons and blue herons, many kinds of ducks and lots of cormorants. It was an amazing paddle. We went about 4.5 miles to Kirby Park, which we found out later is the only place boaters are allowed to get out anyway. Decided to save the rest of the slough for Sunday morning, and after a little rest on the beach, we headed back down. The tide was going out and it was a really easy paddle, with little wind. Still cloudy and foggy, but a bit of sun broke through eventually. The most surprising thing, however, was the much lower number of mammals on and in the water. Most of the seals were gone and we didn't see any otters at all. We realized then that we had been especially lucky with all the viewings, and also were glad that the tide forced us to go so early. As we arrived back at the put-in, it seemed that the kayaker gates flooded open. There were large groups from the Montery Bay Kayak Co putting in, a dozen at a time, and the harbor was covered with lots of brightly colored boats and people learning how to paddle. Boy, we got out just in time! We spent the rest of the day enjoying our camp site, going for some walks, and exploring some of the roads around Watsonville, and visiting the Elkhorn Slough Headquarters. We even drove up to Santa Cruz to find gas that wasn't 4.39 a gallon and were rewarded with 4.29 pg. Hmmm. How many miles was that??? We filled up the baby car so that if we needed to run the generator on the MoHo we could siphon some gas! ha!! might have been a good idea to remember we were dry-camping and have the gas tank full! Sunday morning we were both tired, and said, let's wait till the afternoon tide, but then around 7 there was a break in the sky, and we decided to go for it. We drove the back road to Kirby Park, and this time continued up the slough to it's end at the railroad bridge. We saw more pelicans, egrets, herons, and cormorants, but only one lonely harbor seal and no otters on this day. Another reason to be grateful for Saturday's amazing experience. We had originally planned to go home and make a big breakfast, but decided instead to explore Moss Landing. Both of us were fairly hungry by this time so we thought, OK, change of plans, let's find food! Phil's Fish Market was the perfect choice, where we had wine and fish and chips and went for another lovely walk on the beach, this one much cleaner actually, with surfers and very few people still because of the cold strong winds. Home to a tremendously relaxing afternoon, even a real nap! Something I actually didn't think I could do and instead I slept for a couple of hours. Amazing. We cooked our bacon and eggs and hash brown breakfast for a great dinner and then went for a walk up the dunes to watch the sunset. Another great night sleeping in the cool ocean air, a slow easy morning wake up, and we left for home around 10. Perfect timing to get back to the warm sunny Mother Lode hills by early afternoon. I'm not sure we will ever return to this place, since our list of to-do's is pretty long, but it was a great experience. We are Sue, retired soil scientist, and Mo, retired teacher, currently living in Grants Pass Oregon, home of the mighty Rogue River. Most of our travels are in the MoHo, where we have traveled often since her maiden voyage in 2007, but other kinds of trips are included as well. I write this blog for myself first, as a journal, then for family and friends, so there could be just about anything tucked away in these pages. I must apologize that some of the links to daily photos in the earlier years of this blog no longer work. They were in Picasa web albums, are now buried somewhere in google, hence the link to SmugMug. There you will find MoHo photos organized by year. If you REALLY want to find some, go to the link, find the year and the month you are reading about, and it should be easy enough to find the photos. Archives - Remember, blog posts are listed in reverse. White triangles expand post entries. Completed Room and Happy Easter! UPDATE: hOW IS THE GRAND EXPERIMENT GOING? New address for the Blog! Virginia and New England in 2017?! View and share, but please don't steal content from this blog without written permission from me. Simple theme. Powered by Blogger.